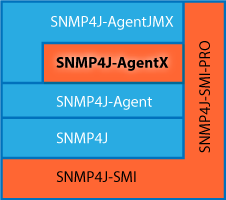 SNMP4J-AgentX implements the AgentX 1.0 master and subagent protocol as defined by RFC 2741 and 2742. It adds AgentX and other enterprise class features to the SNMP4J-Agent Java™ SNMP agent API. Full AgentX 1.0 protocol support, including contexts, shared tables, index allocation, ping PDUs, connection timeout handling, etc. Implementation of the AGENTX-MIB for the master agent. TCP transport mapping for the AgentX protocol. Code generation from MIB specifications is provided through AgenPro which is a language and API independent template based code generator with round-trip generation facilities. Fast and efficient virtual table base classes with row caching for fast and memory saving access of database instrumented SNMP tables.